Another pure, fast acting Bronx Wild Bull product. Creatine Ethyl Ester is a Creatine amino acid molecule with an ester attached. It is a derivative of Creatine. It has been established that Creatine Ethyl Ester is highly soluble when compared to Creatine Monohydrate. This solubility factor enables much faster transport to the muscle. Additionally Creatine Ethyl Ester is much more durable than Creatine Monohydrate with regard to their passage through the intestine. Superior solubility and absorption mean that a Creatine user can take a much smaller dosage of Creatine Ethyl Ester than Creatine Monohydrate. Excess Creatine Monohydrate can result in bloating, stomach discomfort and dehydration. Creatine Ethyl Ester draws more water into the muscle hydrating it without the need for large doses. Dosage: take 3 g (1 & 1/2 metric teaspoons), approximately 30 minutes prior to training for best results. To maximise bioavailability, consume with simple carbohydrates such as fruit juice. Store in a cool dry place and replace lid tightly after use. Bronx Wild Bull Creatine Ethyl Ester contains no fillers, artificial flavours or sweeteners, no caffeine, no added yeast, soy, dairy or gluten, JUST PURE WILD BULL. 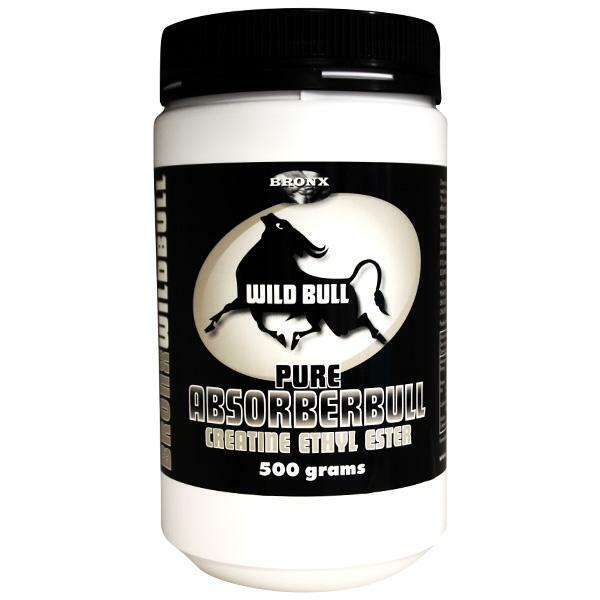 Bronx Wild Bull Pure Absorberbull Creatine Ethyl Ester is suitable for vegetarians and vegans.